Top Five Friday #18 + GIVEAWAY! 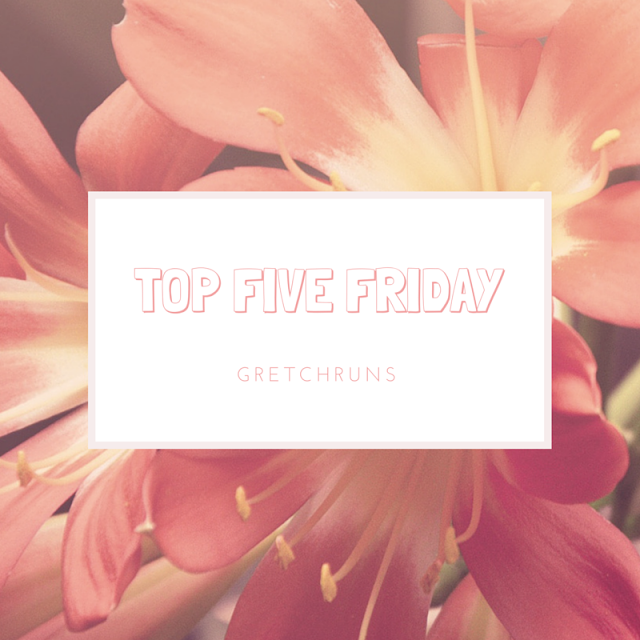 Gretch Runs: Top Five Friday #18 + GIVEAWAY! Happy Friday everyone! How was your week? I'm looking forward to the holiday weekend and have some fun plans. I hope you all have a great weekend as well, and I hope the rain holds off, at least for fireworks! I read Gretchen's book (The Happiness Project) last year and loved it. There were so many great tips in the book, and I love how she focused on one area of happiness a month and documented how it went. I recently discovered her podcast, and love it even more! Each episode is less than an hour long (usually around 25 minutes), and the format is really clearly laid out from episode one. I love the tips, and just listening to the podcast makes me feel happier. Highly recommend! I've been a big TED supporter ever since college. My major was focused on technology and entrepreneurship, so a lot of my classes would show TED Talks for inspiration and to start our brainstorming for class projects. I love the podcast as well, which focuses on one topic per episode, and shares a few talks along with interviews with the speakers. I love listening to this in the morning on my walks with Selma! It gets me excited and inspired for the day ahead! This podcast is one of my guilty pleasures. Tyler and his best friend Korey talk (sometimes with a guest) about what's going on in pop-culture. They are both hilarious, and sometimes I can't help but laugh out loud when I listen to them. It is a pretty explicit show, so listen with caution. This one I like to listen to when I'm getting ready for work! Another great podcast with one topic and a few stories per episode. I love the variety in this podcast and have heard some amazing stories. The topics are always really interesting, and it's the perfect podcast to listen to on the bus after work, or during an easy run. This is actually the first podcast that I ever listened to, and I've been loyally listening ever since I found it! The show has the same format every episode- lots of trivia games focused on current events and a celebrity calling in. I absolutely love this show and listen as soon as a new episode is available. I love listening to the podcast with Dan when we're traveling. The episodes really help pass the time! Honorable mention goes to Serial (as soon as it starts up again), Invisibilia (also in hiatus) and Pardon the Interruption. You should also check out Colin Cowherd's interview with Jim Harbaugh this week! I (semi)seriously considered taking off the entire week of work to stay home and watch all the tennis matches! I settled for following along with ESPN's CourtCast and replaying the best matches after work. Wimbledon is probably my favorite tournament, and I'm hoping Serena continues on her quest for a calendar grand slam! On the men's side, I'm rooting for bad boy Kyrgios and good guy Djokovic! Ho Ho Runs invited me to a workweek challenge on FitBit, and my competitive side goes crazy when I see people ahead of me! I started taking walks around downtown Pittsburgh during my lunch, and it's been great! This weekend is the annual Three River Regatta, so the entire Point State Park area is gorgeous, including the incredible sand sculpture below! It's almost college football season! I always get major chills watching these videos, and I'm so excited for the season to start. As an old member of the Blue Band, the start of the season always brings up amazing memories of marching in Beaver Stadium. I'm hoping for a Big Ten championship run and another bowl game win! A few weeks ago, I was contacted by Massage Envy to try out a facial! I never had one before and didn't know what to expect, but I absolutely loved it. The team in Squirrel Hill made me feel so comfortable and explained every thing that was going on. The table I laid on was heated with lots of pillows and soft blankets, and the whole experience was relaxing (I even got a short massage while the serums were sinking in!) I woke up the next morning with a few more breakouts than normal since they extracted some clogged areas, but everything looks amazing now. In college, I took Tai Chi for one of my health credits, and I absolutely loved getting in the practice of meditating every day. Since graduating, I quit doing it and want to get back in the habit. I've tried out some apps that help guide you through short meditation sessions, and my favorite so far is Headspace! I'm still in the free part of the app, but I'm deciding if I want to get a membership. It's so relaxing! Check out other suggestions here. Love, love, LOVE Yo-Yo Ma and this is my favorite song of his. It's such a gorgeous song and really highlights the sound of the cello! I loved these two on the X Factor (which they ended up winning) and their debut album is amazing. Their voices mesh together seamlessly and their music is absolutely beautiful. If you saw them on the show, you know just how adorable they are together, and that love radiates in their songs. Christine let me know that this is one of her current favorite songs of the moment, and now I'm obsessed! I immediately added it to my workout playlist, and it gets me pumped up every time it comes on! This group competed on (and won) Britain's Got Talent last year, after forming just days before. Their album is absolutely gorgeous, and my favorite track is this one from the Wizard of Oz! I could listen to it non-stop..it's so soothing and gives me chills. I recommend you checking out the entire CD though! Don't forget to enter the giveaway! Leave a comment letting me know why you need to treat yourself. Well, I think my reason for treating myself could really be anyone's haha - but as runners, we put our bodies through the shredders day in and day out. We deserve a break to be pampered!! Also, I used to play the cello - love Yo-Yo Ma! I did not know you lived in Pittsburgh! I'm also a PA gal! Those sculptures are cool. I need to treat myself more so for my mental health than physical. Trying to figure out what I want to do with my talents when I graduate college and what careers will help me fulfill my purpose has me having a mini "quarter-life" crisis this summer! Having a little break would remind me to take care of myself, not stress so much, and that I am worthy no matter what I end up doing. I haven't been to Massage Envy in a couple years. It's nice to be pampered but they're a little pricey and keep trying to hoc their membership. I did Tai Chi too! My sister was the president of the Taoist Tai Chi Society here in Vancouver and I wanted to try it out. She took up running (I trained her for a half marathon) and I did Tai Chi. I love your list! I need Podcast ideas, so I'll bookmark this page and come back to it. Since middle school, my skin has always been a problem for me. I've had pretty horrific acne for a good chunk of my life. Thankfully, I've gotten it under control with medication, but I still have some clogged pores and white heads that just won't budge. A facial would be the perfect way to help me finally be comfortable in my skin! Serial is the best podcast of all time, ever!!! I've listened to it 3 times and could talk about it all.day.long. If you are curious about the case, or want more info there is another podcast about Adnan called Undisclosed that has a LOT more detail. I'm hooked on that now too :-) I'm always way behind in new music. Best example? Uptown Funk. I heard it for the first time maybe a month ago and I'm hooked. Then, our summer intern told me that it was cool...back in November. hahaha!!! Ummmmm a facial sounds divine!! I've had one and it was spectacular. I struggle with acne along my chin and jawline and anytime I have to opportunity to treat that, I take it :-) . Plus...who doesn't like to be pampered?! Thanks for the podcast suggestions! I'm always looking for new ones. A facial sounds amazing. After an exhausting and overwhelming week I could use a facial to relax and (maybe) brighten up my tired faces. This is awesome, Gretchen! I am new to your blog but it looks like we have a lot in common. :) I share my favorite podcasts here: http://www.emmabyers.com/2015/06/lend-ear-favorite-podcasts.html - similar, right? Happy 4th! l love a good facial but haven't treated myself in a while. They are so relaxing. I'm so glad you joined the challenge this week! It's crazy what those things to do me. I am in two right now and probably won't win either one. In fact thunderstorms this evening kept me from getting those last few steps. HA. Also, I've never listened to a podcast!! Facials are the best! I have been saying it's time to treat myself again... it's been months! Enjoy! I think everyone deserves a chance to treat themselves! A facial is a great reason to just disconnect and relax, something that doesn't happen often! I'm not sure that I've heard those songs. Hope you had a great weekend! With the Texas humidity getting crazy in July, it would be great to get a facial to clear out my skin after sweating like a pig on my runs outside! What a great giveaway! Thanks for doing it and congratulations on your first one! I have breakouts on my chin and around my lips and I feel like I can't get rid of them! I would love to win this facial especially after seeing you woke up the next morning with fewer breakouts. We are headed to the beach in August and I would love to have clear radiant skin since I will be without make up a lot of the time we're there! I'm new here, and I'll be sticking around since you're a college football fan :) I hopped over from the Show & Tell linkup. I've never had a facial and I would LOVE to have one - my face needs a nice refresh. I need to treat myself because I'm coming up on another 3-month I-need-a-break, haha. The last long weekend I had was Memorial Day weekend, and I wouldn't mind taking one soon ;). I love watching tennis!! Haven't been able to watch much Wimbledon, though. I need to treat myself because I've been in a funk. Work has been crazy, we had 2 people quit right around the same time, and while we've found replacements we're still trying to train them to get up to speed. With a department of only 6, 2 people is quite a chunk. And because I'm in Pittsburgh too, and excited to try out the Massage Envy in Squirrel Hill!